Bombay Sapphire London Dry Gin or Ketel One Vodka served bruised up, or on the rocks. Garnished with our own bleu cheese stuffed olives. Bourbon, bitters, muddled with fresh orange and maraschino cherries. Chilled and served on the rocks, garnished with a twist of orange. Bourbon, Cinzano Rosso Sweet Vermouth and bitters. Served up or on the rocks and garnished with a Luxardo maraschino cherry. 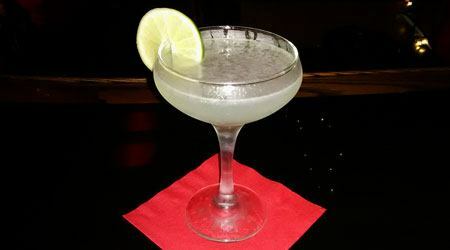 Beefeater London Dry Gin or Tito’s Handmade Vodka, fresh squeezed lime juice and simple syrup. Shaken and served up or on the rocks. Booker’s True Barrel Bourbon, Fever-Tree Ginger Beer, fresh lemon juice, simple syrup and bitters served over ice. Tequila, triple sec, fresh grapefruit and lime juice with a dash of simple syrup. All served over ice with a salted rim and a splash of club soda. Brandy, triple sec, fresh lemon juice and simple syrup all served up with a sugared rim. Vodka, triple sec, fresh squeezed lemon and lime juice. Served up with a splash of cranberry and a lemon twist. Brut American champagne, sugar cube, Angostura Bitters and a twist of lemon. A Turf Club twist on a timeless classic which is loaded with our signature blend of red wines, spirits and fruit. Our 22oz secret tropical temptation layered with white, amber and dark rums. It’s vacation in a cup! Malibu Original rum, amaretto, sweet & sour, pineapple and orange juice. A classic minty, chocolaty dessert cocktail. Vodka, crème de menthe, crème de cacao and half & half. Shaken and served up.